The spicy flavors of the legendary "Silk Road", all encompassed around succulent shanks of lamb braised in a wine and prune sauce. Plate these atop an Armenian rice or bulgour pilaf and a green salad and sit back and enjoy the accolades. The "Silk Road" was the passage way from Europe to Asia and back again. It was the route Europeans and Middle Easterners took to the Orient to trade goods for silks and spices. In the process, the cuisines of at least two continents were forever melded together. Marco Polo and his introduction of Chinese pasta to a hungry Europe is a prime example of the importance of this long and sometimes treacherous route. 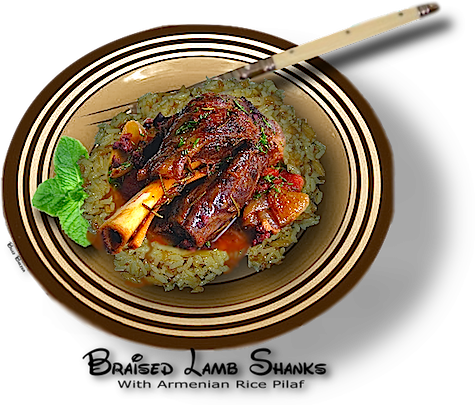 Lamb shanks are a delight from Italy to the Asian continent, and it is no wonder that the lamb eaters of the Middle East would encompass it in their diet. 1. Mix the paprika, cumin, cardamom, cinnamon, all spice, cloves, salt and pepper in a bowl. 2. Rub the spice mix onto the lamb shanks creating a spice covering that coats the shanks completely. dutch oven and brown the lamb shanks well on all sides. Remove the lamb shanks and set aside. onions and plums and set aside. 4. Add the white wine and cook down by half. 5. Return the lamb shanks, onions and plums to the pot. 6. Add the chicken stock.